In a day when people use smart phones, think pads, and every other techy-gadget out there, why would I still recommend using a “black book?” Here are the reasons that I use one, and I will include some pictures to give you examples. 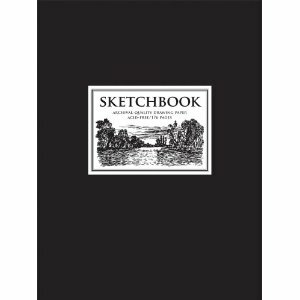 I am sure some these things I am sharing as what I LOVE about a sketch book are possible with some form of technology . . . but don’t even bother telling me. I have ordered my supply of “black books” for the remainder of my life . . . Visual Calendar: I love seeing 10-12 weeks at ONE GLANCE. For me, this is very helpful. On my phone, it’s one month at a time, in my day timers, same thing. I love to hand scratch out a 3 month window and see what is coming . . . I often will then work on an action list from that calendar. It seems like when I see it at a glance, there are always things that need to be done in preparation. Box “To Do” List: Some people like “lists” and maybe some don’t. For me, I love a list that I can refer to, see, and specifically, check-off the box showing that it is DONE. Notes: Whether I am listening to a talk or preparing to give a talk, they both start with notes. I bring my book with me to church, to every meeting, to every appointment, and as I sit in my airplane seat I stow everything but a pen and my black book. Scotch Tape: There are certain things for me, for example, a Regional Financial Summary, I will cut out and tape into the book. I also tape in random “lists,” directions for a future meeting, an email with info I want for another meeting. If I am going to a meeting for a golf tournament for an example, I will tape in our player list, as well as a mock budget. It’s info I know I will want. Reflection Time: If I am praying, if I am writing down thoughts, reflections, or things I sense God might be nudging me on . . . it’s in the Black Book. I have a prayer list of who I want to pray for, and I have my own “Life Plan” in the book for weekly review. The “Chuck”: Many, many decades ago I had a meeting with a guy named Chuck. (Chuck Reinhold, at the time was the VP of the Eastern Division of Young Life.) Chuck asked me a question, and as I answered he began to take notes on what I said. It stuck with me – I want to be a note taker, and specifically, a note taker on what people say to me. It is quite affirming when someone writes down what you say . . . so I like to do that! Do you want one? The first 5 people that contact me and want one, I would be happy to send one to you! Everyone else, here is the specific book I use and where you can get one for yourself on Amazon. Just read this sitting here in my office and glanced over to my row of completed ‘black books’….LOVE THIS POST! love YOU – stop using the small one and get back to the Black Book! But can your black book play Angry Birds? Well, in it’s own way . . . I love that I know my name is in those books! Thanks for your investment and friendship. I couldn’t agree more! I use graph paper composition books, (I write very small most of the time) always have one with me! I also like to draw out a three month grid and I have a book for every project I have worked on back to 1992. I also have some smart technology, but I keep using my books. I use different colors for my different companies. I really enjoyed your blog! Must be a Saxon thing…..
I’ll take one! Need to start becoming more dad like. Great Men of God talking about important things! I am privileged to continue to be and to have been among you. Thanks for posting this Eric…..my “black books” have too often came in many shapes, colors and sizes and are now found in books, folders, day timers and on hard drives and discs. My best ones of late have “apples” on them thanks to the great influence of Leeper. One book, one pen, always with me…..worth considering…..along with my apples. This will be an awesome tool! 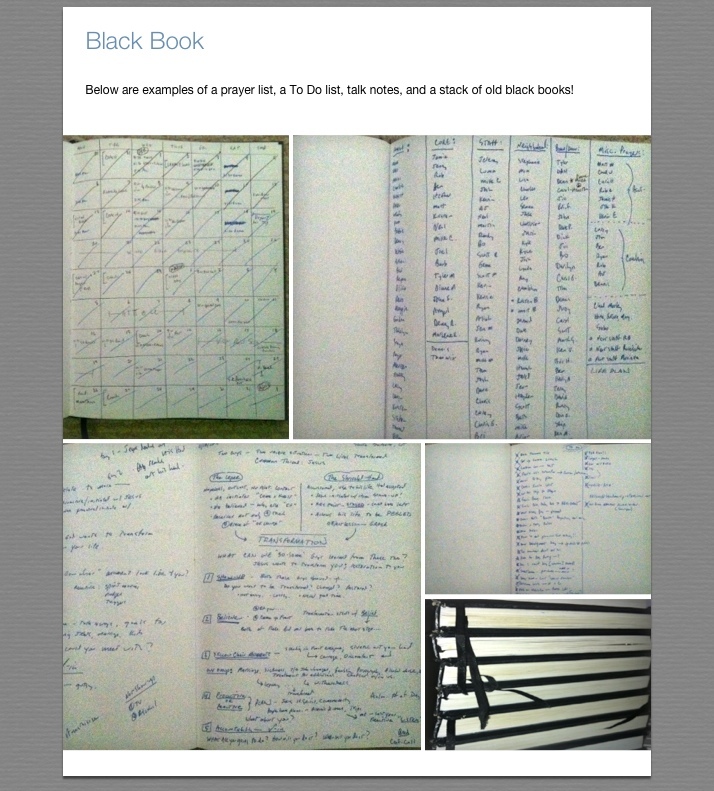 Thank you for sharing I most Deffinately want a black book!